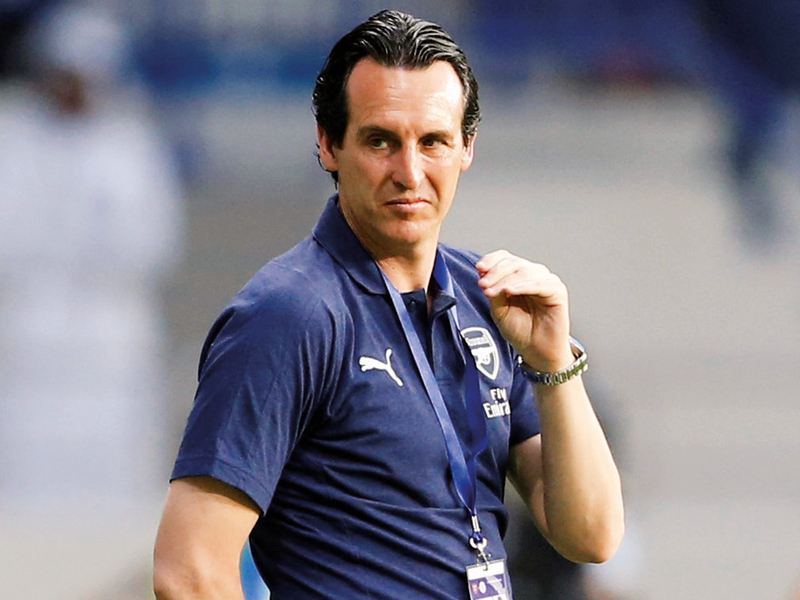 Dubai: English Premier League (EPL) side Arsenal left Dubai on Wednesday with the renewed vigour of chasing down their two-pronged goals by the end of the season in May. Having spent five days of warm weather training, Arsenal signed off with a 3-2 win over Dubai team Al Nasr in an exhibition tie to mark the formal opening of their Al Maktoum Stadium late on Tuesday. Arsenal coach Unai Emery was thrilled at the way his players responded after going down by an early goal to eventually win the game. “It’s like being at the crossroads for us. On the one hand, we have the Premier League and on the other we have the Europa League and both can take us to the Uefa Champions League for next season,” Emery said. “Not only are we being competitive, but we have been improving with each match. Right now, we have the last eight matches remaining in the Premier League and we need to maintain our focus for all of these. We are aware that Tottenham Hotspur, Manchester United and Chelsea are the main ones blocking our path from reaching our goal. We know it is going to be difficult as they are big teams as well, but we know we have been working very well towards our goals,” he added. “We are confident simply because we have huge chances in these last few games. Each match is as important as the previous one. We want to take one match at a time and enjoy each game with the possibility of winning maximum points and taking our spot. The next one is Newcastle United and the three points,” he insisted. Arsenal were soundly thrashed 5-1 by title aspirants Liverpool at the fag end of 2018 but since then, the Gunners have done well with eight wins and a draw in the next 11 matches played. Following their 2-0 win against Manchester United on March 10, Arsenal have slipped into fourth overall with 60 points, just one shy of cross-city rivals Tottenham Hotspur (61). However, with just eight rounds left of the EPL, Arsenal will have to be wary of no further slip-ups as Manchester United (58) and Chelsea (57) are close behind in fifth and sixth, respectively. Arsenal’s immediate assignment on returning to London will be at home against Newcastle United on April 1 followed by a visit to Goodison Park against Everton on April 7. Running parallel will be their home-and-away Uefa Europa League quarter-finals against Napoli on April 11 and 18, respectively. “In the Europa League too, we are in a similar situation as it is make-or-break for us from now on. We need to find our way through and we need to take our chances. I sense that we are at the right moment, both physically and confidence-wise. These past few days have been great for everyone as they have connected with each other and this can only help our confidence and desire to back each other as we enter a crucial phase of the season. We are looking forward to making the difference for us in the next few matches,” he added.